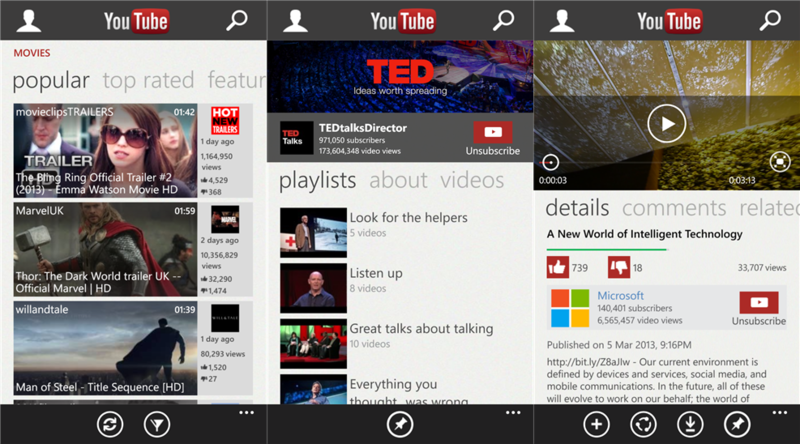 Microsoft on Tuesday announced it has revamped YouTube for Windows Phone 8. You can get the latest version of the app now directly from the Windows Phone store. Microsoft says the app has been “completely redesigned” to make the most of Windows Phone 8’s features (a Windows Phone 7.x version is in the works and “will be released soon”). The main addition in this vein is pinning support: the app now lets you pin videos, channels, playlists, and search results right to your Start Screen. In fact, this new YouTube pinning feature extends to Kid’s Corner. That means if parents limit content with YouTube Safety Mode settings, and pin the app to the Start Screen, they don’t need to worry about their children viewing content they don’t approve of. Previously, YouTube for Windows Phone basically consisted of the mobile YouTube site. Now it’s a full-featured app for Windows Phone 8, which should significantly hurt the unofficial YouTube alternatives that have sprung up on the platform. Earlier this year, Microsoft claimed Google was preventing the company “from offering a high-quality YouTube app for the Windows Phone.” It appears the two have figured out a way to move forward, a decision which not only will be celebrated in Redmond but also all around the world wherever there are consumers with a Windows Phone device.